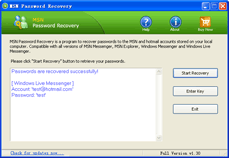 MSN Password Recovery is the MSN Messenger password finder that is used to recover lost or forgotten passwords for your MSN Messenger, Windows Live Messenger and Windows Messenger accounts. It works when the "Remember my Password" or "Sign me in automatically" tickbox is checked in the messenger. One click and get your lost password back. * Recover passwords for Windows Messenger, MSN Messenger, Windows Live Messenger, Hotmail.